There are no new GPUs on the immediate horizon, but can Sapphire's Radeon HD 6970 Dual Fan edition make up for that? If you're into some freakish overclocking numbers then maybe it can. The Cayman XT-based HD 6970 is the company's fastest single-GPU based card out of the box. But what if you want it to go even faster, how do you go about it? Well, in the case of AMD's biggest board partner, Sapphire, you replace the PCB with your own design, build in improved power components, throw the reference cooler in the bin and replace it with a custom dual-fan design. Then finally you tweak the twangers off the standard HD 6970's dual BIOS to offer a choice between normal and super-duper, voltage-crazy overclocking. The OC options allow access to higher voltages for the core, faster memory speeds and faster fan speeds. The resulting HD 6970 Dual Fan Edition offers the choice between using the standard clock speeds (880MHz core, 1,375MHz) or, by flicking a switch, and using Sapphire's own TriXX overclocking utility, which is a good deal faster. 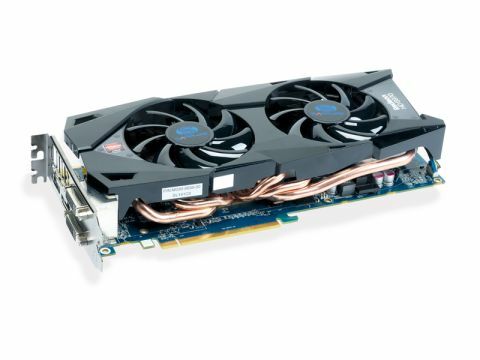 What's important about this Sapphire HD 6970 is just how much farther can we push the card now that Sapphire has been delving around in it's design. Out of the box, a standard HD 6970 has clock speeds of 880MHz for the core, while the memory trots along at 1,375MHz (5.5GHz effective), it's fairly speedy and will cope with any modern game with aplomb. In standard mode with the card's reference voltage of 1.75v we got the Sapphire HD 6970 to run stably at an overclock of 965MHz on the core with the memory running at 1,497MHz (5.9GHz effective), which is pretty impressive. Although in this mode the TriXX utility only allows a voltage of up to 1.2v. Thankfully through Sapphire's wizardry and the OC switch, we were able to test at 1.2 volts and above. The secondary BIOS is all about the power tweaking. When the BIOS switch is in the normal mode, the PowerTune technology of the Catalyst Control Centre offers plus or minus 20 per cent. Switching over to the overclocking BIOS, this is boosted up to plus or minus 50 per cent to allow as much power to the card as possible. So needless to say we had to do just that to see what the card was capable of reaching. The benefit of the additional power is that the clocks are not being throttled back by PowerTune. We managed to get all the benchmark games we used to run stably at 1,032MHz for the core (150MHz overclock) and 1,525MHz on the memory (150MHz for the memory). We managed 1,120MHz for the core and 1,528MHz for the memory, while still being able to boot stably into Windows. It wouldn't run the benchmarks stably but it did give an idea of the cards capabilities. So AMD's Cayman XT GPU is capable of impressive overclocking shenanigans then, but the credit must also go to Sapphire's heatsink and dual cooler design. It's amazingly quiet at normal speeds, only becoming noticeable as things get a bit hectic with some serious overclocking.